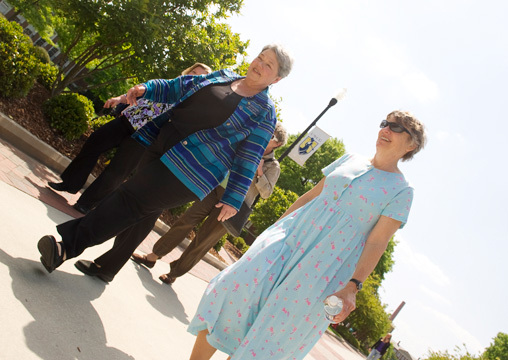 Staff members Betty Betts and Mary Jane Conger participate in an organized campus walk for Spartan Steps, a wellness initiative designed to promote team spirit, encourage a little friendly competition among participants, and help improve overall health and wellness. Led by public health education professor Dr. Dan Bibeau, students, faculty and staff developed an employee wellness program to support healthy lifestyles through social, physical and mental well-being. Named HealthyUNCG, the program kicked off on Feb. 15 with 350 employees and 18 exhibitors in attendance. A comprehensive web site and a plethora of activities and resources offer UNCG employees support in achieving a healthy lifestyle. In response to changes within the State Health Plan and in support of the university’s strategic initiatives, Human Resource Services has collaborated with HealthyUNCG on many endeavors and also sponsored many of its own wellness programs. Among them are three sessions of Weight Watchers at Work, during which employees lost 600 pounds for the first session alone, and Spartan STEPS, which inspires employees to walk 10,000 steps each day. More than 250 employees are still actively participating in Spartan STEPS. Through HealthyUNCG, employees can also take advantage of a free personal wellness profile, a general health assessment that measures overall health and wellbeing. HealthyUNCG is one of a number of initiatives created to advance UNCG’s strategic goal of enhancing health and wellness across the lifespan.